It's been a long time since I thought about this game series. My memories with Double Dragon are entwined with the smoky atmosphere of 80's arcades when I was barely tall enough to see the cabinet's screen. I also associate these titles with the home computer conversions I used to play and really enjoy. Recently I found a package released on the PC which has brought the three classic Double Dragon games together, added tighter controls and better presentation. Before I talk about this collection, however, I want to take a look back on these seminal titles histories. Journey with me, back to a time of 80's optimism, places of bright lights and booming audio - let's go back to the arcades. Double Dragon was not the first of it's kind to bring flying fists and kicking legs to the arcades. That honor would belong to another classic Kung Fu Master. In 1984, this was the #1 arcade hit, the 80's obsession with martial arts and action movies (particularly The Karate Kid series) fired imaginations and this became one of the most popular games you could play at the time. It was a side-scrolling beat-em-up, where you moved upwards through the Devil's temple as you attempted to rescue your girlfriend from the evil Mr. X. It was like playing through the unfinished Bruce Lee classic Enter the Dragon and although simplistic by today's standards captivated my generation. Kung-Fu Master was the first arcade beat 'em up game. It was easy to control and offered a fast paced challenge. Taito would capitalize on the success of Kung-Fu Master and craft their own version of a martial art's beat -em up, albeit with some differences. In 1986 Renegade was released to widespread acclaim, it again featured a plot which involved a kidnapped girlfriend. But in this title, you didn't play as a clean cut Kung Fu Master, instead, you were a streetwise martial arts expert and you journeyed through gritty urban locations such as subways and dark alleys, dishing out punishment to punks who need to be taught a lesson or two. It was this change in tone that began the production of a slew of beat -em ups, with familiar plot devices and environments. The gameplay innovations brought to the arcades in Renegade and the fast-paced style of Kung Fu Master would eventually be fused together as Taito developed its next project - Double Dragon. 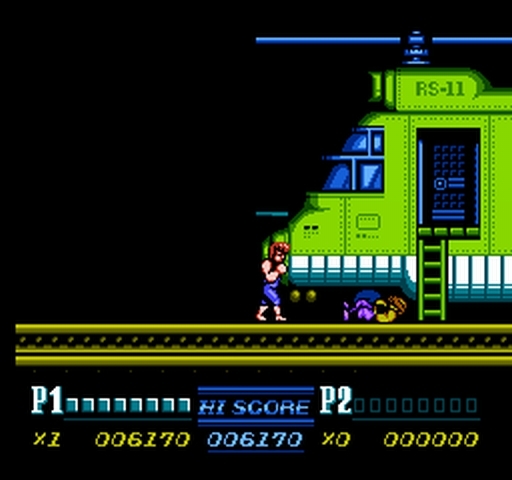 Double Dragon featured the scrolling screen, the backdrops of alleys and subways, but would add important elements like co-op multiplayer to the genre and the ability to use enemy weapons, such as baseball bats and barrels. The narrative of the game was the tried and tested plot device of rescuing the girlfriend, but although the plot was cliched the opening scene with the garage shutter going up just as the kidnapping took place, has become iconic and often lampooned. The gameplay featured a variety of moves that you could pull off to inflict punishment on the bad guys. You weren't just limited to punches and kicks - but could also throw weapons, headbutt, jump kick, elbow an attacker in the face and throw an enemy, if you found yourself in a headlock. Double Dragon was then produced for the NES in 1988, this is perhaps the most famous home conversion. It wasn't really comparable, due to the limitations of the system. It was still a solid title but lost the two-player co-operative mode, keeping enemy weapons until the next stage and some of the various move sets from the arcade. A slightly cut down version of the game, this NES title is still an excellent game! A Master System version would later be released by Sega, with some improved graphics, which made the game a little closer to the arcade original. Additionally, a whole slew of home computer versions of the original title became available, the ZX Spectrum, Commodore 64, Amstrad CPC and Amiga had their versions. Most varying wildly in quality. Double Dragon was one of the most ported games during the 80's and crossed over to virtually every system available. This is the one I played - the Amstrad CPC version, colourful with decent hit detection. In 1988 Taito released the sequel - Double Dragon 2: The Revenge, this time the developers decided to kill off Marion and have Billy and Jimmy fight to avenge her cruel murder. There were a few changes to the control mechanics, providing new button setups to enable directional attacks, new weapons, and stages. Double Dragon 2 also provided new moves such as the hurricane kick and improved sprite design. This was another commercial success for Taito and was again ported across various home systems during the late 80's. Again the NES port of this game is perhaps the best known, it was very similar to the original title but enabled two-player co-operative play. The game also had an expanded storyline, including cutscenes and additional levels not seen in the arcade machine. The player could also bring Marion back to life once he had defeated the game - a move not attempted in the arcade. This became another well-received title and is fondly remembered today for attempting to surpass its arcade parent. The third in the trilogy was released in 1990 and is generally considered to be the weakest entry in the series. The plot change significantly and saw Billy and Jimmy, along with new character Sonny, around the world to find the famous stone and defeat a mysterious new enemy in Egypt. The game was poorly received and having played through it again, although definitely not to the same standard as the initial two games, I think it has been unfairly criticised. The main issue I have with the title is the choppy framerate and poor character animation and design. The move set is fairly decent and you can purchase additional characters such as a chubby Kung Fu fighter called Seimei at the shop. It's still playable, but don't expect the game to enthrall you in the same manner as the first two titles in the series. So, how does the Double Dragon Trilogy title stack as a compilation of these three titles?Overall these are great ports and Dot Emu has attempted to present each of the titles in the most attractive method possible. There are two modes of play in the game - Arcade and Story. The former is the classic way to play through the series, starting at the first level and trying to get as far into the game as possible before your continues run out. The Story mode allows you to begin the game at whichever stage you want (providing that you had reached that level before) - I was a little disappointed by this. The name of the mode is a little bit of a misnomer, I was hoping for a new overarching narrative to play out in this mode. So Story Mode is really just a fancy save system. More importantly, this compilation has some new features, such as excellent support for modern controllers, a more consistent scrolling speed with none of the arcade slowdown. There's also an excellent remixed soundtrack on offer, the ability for players to change video options, such as being able to see scanlines and change the aspect ratio. It's also obvious that the visuals have been polished for this compilation release. Hopefully, you enjoyed this whistle-stop tour of one of the most important game series ever made, did it evoke memories or maybe the inclination to play it again - or for the first time? Let me know in the comments section below.